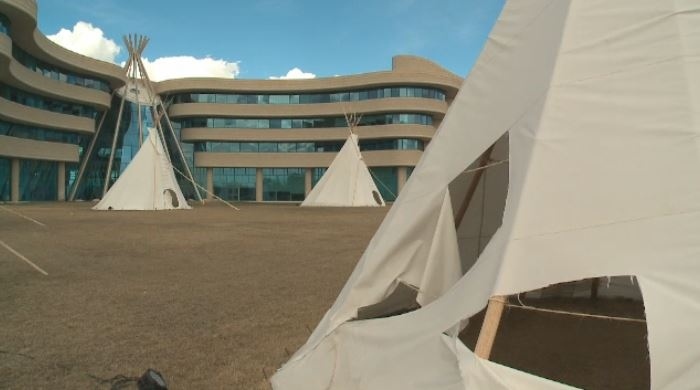 Two of the 14 tipis that have stood in front of the First Nations University for the past year have been vandalized. The two tipis were slashed with a sharp metal object, like a knife, over the weekend. Regina police say a report has been filed, but there was no physical evidence left in the area that could help identify a suspect. Peter Brass, who is in charge of the installation art project, says it’s disheartening. Brass plans to repair the damaged tipis and will be taking them all down for lawn maintenance. He wants to have them back up soon as a new art piece. Anyone with information about the vandalism is asked to contact police. Twp tipis in front of the First Nations University have been vandalized.